Since signing up for Land Run 100 last fall I’ve been willing the universe to deliver warm and dry conditions for this notoriously wet and muddy race. Every time someone brings up the subject of red clay, tire clearance, and hike-a-bikes, I’ve steadfastly told them to hush and that it’s all nonsense since we’re going to have bone-dry dirt roads to float across come March 17. Then, something incredible happened. Last week when the 10-day extended weather forecast finally showed Saturday’s predicted weather, I came to realize that I actually do have secret, super powers to manipulate the weather! Who knew?! So far, fingers crossed, it looks “pretty” dry and warm… and of course windy. These forecasts change every time I check them but I’m sticking with the warmest, driest options for now. That all being said, I’ve decided to roll the dice with a dry setup and hope that it’s just a fluke that the “chance of rain” section of the forecast continues to grow and it’ll be back down to 0% with the next update that comes in 10 minutes. So, all you mud clearance-haters out there that are invariably going to mention that I don’t have enough clearance for that peanut-buttery, thick and gooey Oklahoma mud, just wait until Saturday to dig in, will ya? My first ride on a Devinci Hatchet included shuttling up a twisty mountain road high in the Sierras before dropping into some sublime, singletrack trails and loose fire road descents. It was the most fun I’d ever had on a drop bar bike. Until the next day, when I rode the Hatchet nearly 60 miles up and down these same mountain roads as part of the Grinduro gravel race. This was, and still is, one of my favorite days on a bike. Ever. While much of that bliss had to do with the amazing group of friends I got to share it with, the bike also helped in the equation. The Hatchet is a fun gravel bike. It was built for singletrack sidetracks, for tackling steep, rocky descents, and for hucking around like a mini mountain bike. It was designed by a mountain bike company, Devinci, and you can feel this in how it handles. It has a long top tube and short, stubby stem, slacked out head tube angle, long wheelbase, and big tire clearance (room for 40mm tires with 5mm clearance on each side). Grinduro with the gang. What a fun race! Does this “fun” geometry translate well to long, straight, rolling mid-west gravel events? I’ll find out in a couple of days. But so far, the bike has been super comfortable on everything from short interval days to long training rides over 100 miles. It’s stable on loose gravel and feels fast on hard pavement. So, I’m pretty confident this bike is going to crush at Land Run. I’m running Donnelly X’Plor MSO 36mm tires this weekend because as we’ve already discussed, I won’t need tons of room for mud since it’s going to be dry. These are my favorite gravel tires and I’ve raced just about every gravel race from DK200 to Grinduro to Gravel Worlds on MSO tires. Sure, they’re probably overkill for the smooth Stillwater roads but sometimes taking the thinking out of the equation is more beneficial for me than obsessing over what’s faster, lighter, or a better width. Plus, I’m going into Land Run with a fairly relaxed attitude. I’m there to race of course, but I also don’t have many expectations after a full cyclocross season. All that said, I tried to keep my bike setup simple, straightforward, using gear that I know well. Full disclosure, I work in PR and communications for Shimano. Despite this relationship I can honestly say that Shimano’s Ultegra Di2 drivetrain and hydraulic disc brakes would be my choice for gravel even if I had no affiliations at all. Electronic shifting is da bomb and is especially great in gritty conditions like we often find at gravel events. Gunked up cables and missed shifts just don’t happen with electronic drivetrains. If you haven’t tried it yet, I highly recommend it (and I especially recommend Shimano’s Di2 system… wink, wink). My gearing includes 50/34 front chainrings with an 11/34 cassette. This gives me such a huge range of gears from a massive (in terms of gravel) 50-11 big gear to the spintastic 34-34 little gear. I’ve decided to go with a 2x drivetrain rather a 1x setup to keep the jumps between gears smaller. One other thing to note on the bike is my PRO Stealth saddle. I only mention this because it’s a new saddle for me this season and I’ve been loving it. I’m a longtime Specialized Ruby saddle user but gave the Stealth a go after hearing great reviews and I have not been disappointed. If you’re having saddle issues, I’d recommend giving this one a try as it seems to work for a wide range of riders and body types. Gravel races can be long and miserable at times but that doesn’t mean your saddle should be uncomfortable! When it comes to carrying food and water, I’m planning on two bottles on the frame, a small top tube bag for snacks, and wearing a CamelBak Chase Vest. Once again, this setup might be overkill depending on the conditions and speed of the race. But I want to wear the Chase Vest and get to know it well before heading to DKXL’s 350-mile race in June where I’ll definitely want that extra water and gear capacity. So why not give it a shot at a shorter race and get my systems down early? That’s it for my Land Run 100 bike setup for now. Nick and I are getting excited for our trek down to Stillwater this week and to catch up with all our extended gravel family members. We can’t wait to hit the start line with everyone and soak up the warm Oklahoma sunshine and joke about how we were all so worried about the rain. Let’s all keep ignoring those chances of rain for Saturday and keep willing the clouds to float on past without a word…. Just don’t look at the most recent extended forecast… gulp. Might need to wield those superpowers soon. There's a big upside to riding the same size bike as your wife. This Crux carbon is one of them. It's the same bike Kristen (KP) raced to 4th place at the USA Cycling Cyclocross National Championships in the women's singlespeed race. With a swap of the seatpost, saddle, bar, stem, and pedals, it's ready for action on the gorgeous roads of Stillwater, OK. I geared up to a a 40x17 (for now) and threw on some Vittoria tires to keep room for mud. Why singlespeed? Well anyone who has experienced a wet year at Land Run already knows. For those uninitiated, the red clay mud in Oklahoma has a reputation for destroying drivetrains. But I also love riding a singlespeed. It keeps me focused throughout the race, pushing whenever possible and providing some recovery on tailwind and downhill sections. It won't be the only gravel event that I race singlespeed this year. I'm super stoked to see loads of friends at this year's Land Run. My wife Kristen will be there (a post of her race bike is coming soon!). So too will several homies from Colorado's Front Range. We'll join up with peeps from all over the Midwest including Jason Gaikowski, Jim Cummins, the infamous O'Mara brothers, Ryan Balkenhol, and others! Stillwater and District Bicycles will be THE place to be in a week's time. For that weekend, it is the epicenter of the gravel world! Right now I have on a 40x17 gear using a Rotor non-Q, narrow/wide ring and a Surly cog and Singleator. A SRAM 8-speed chain connects it all. iSSi Flash III pedals with 58.5mm spindles keep my knees aligned and happy. After testing a range of saddles over the past months, I'm back on Selle SMP models. The Blaster is designed for mountain biking, but I like the shape and firmness quite a bit. I mounted it to a Moots titanium zero-offset post for some additional comfort. The Rapha Boulder AssSaver is a nod to the rain gods. A well-used Pedro's seat pack made from recycled inner tubes is one of my favorites. It securely holds 2 inner tubes, patches, a multi-tool, CO2 cartridges (2) and inflator, a section of chain, quick links, chain lube, and a pair of nitrile gloves. I'm running a pair of Vittoria's excellent Terreno Mix tires in 33mm. I could go wider but I like to have loads of mud clearance for Land Run. Thanks to Ken Avery for sending those over! They are mounted to the stock Roval carbon wheels. They're light, strong and set up tubeless easily. I've been loving this little Profile Design Aero E-Pack top tube bag. It has three Velcro straps (I cut the middle one off) and elastic cords around the steerer. The bottom is rubberized to help it stay in place. It's also compatible with frames that have top tube bag mounts. It's large enough for a couple Clif bars and three or four gels. On the frame I have a pair of Arundel Stainless Steel cages. I'll likely run large bottles and the Arundels hold them tight. I also have a PRO mini pump mounted on the down tube. The cockpit consists of a Thomson stem (made in Georgia! ), an Easton AX90 carbon bar, Arundel tape, Shimano RS685 hydro brake levers, and a Wahoo ELEMNT GPS unit. Nothing too fancy, but all comfortable and functional. I considered aerobars but riding singlespeed means I'll spend more time out of the saddle. I also went a bit wider with the bars and taller with the stem for the same reason. Thanks for reading! If you'll be at Land Run, please say howdy! Also please take the time to like Rambleur's Facebook page. Stay tuned for KP's bike choice! My beloved Black Mountain Cycles, seen here in Dirty Kanza 200 trim. Word of mouth can be a powerful thing. I first learned of Mike Varley and his shop and bicycle label Black Mountain Cycles through Guitar Ted. 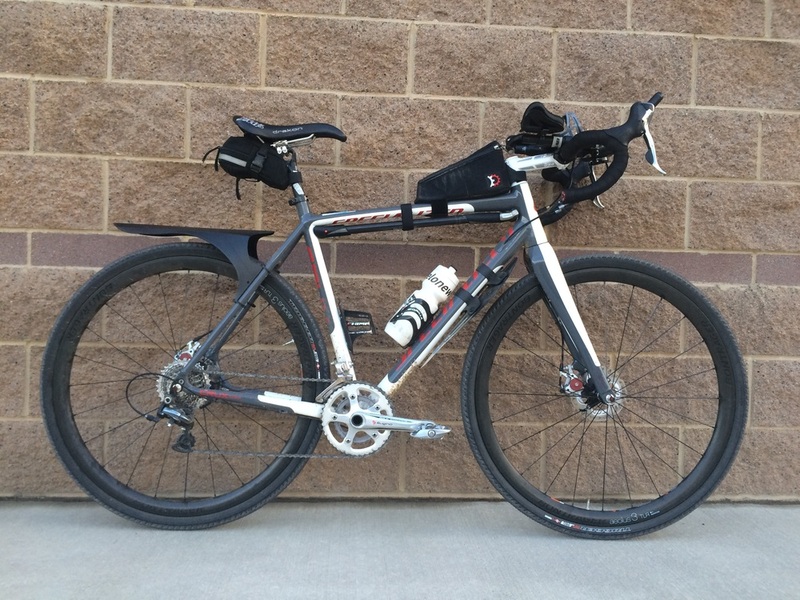 GT raved about the ride, the tire clearance and the affordability of his "BMC" gravel machine. I'm a big fan of steel in any case so it wasn't hard for me to be convinced of the appeal of framesets that Black Mountain Cycles offered. So, now that I've purchased a monster cross frame of my own, it's only fair that I continue the word of mouth for these fantastic bikes. Once my interest for Black Mountain Cycles was piqued, I began reading Varley's blog and loved what I read. It was practical, showed huge experience and most of all, great passion for cycling, its past, present and future. Both Varley's road and cross frames are made overseas in small batches. When I first checked his site there were a couple in my size available, but none in a color that won me over. When Varley announced that one of his new batch colors would be a bright pink seen in years past on bikes with an "S" label, I was stoked. When he added that the new run would also have a Pacenti PBP fork crown, a third bottle cage mount and slightly tweaked geometry, I was sold! I emailed him and put my name on the waitlist. I had many of the parts on hand to build the bike. That was half the beauty of the project; it would cost me a frameset. After several hundred miles on the bike, I'm still playing with setups but I absolutely love how the bike handles and how well it tackles pavement, gravel, dirt and singletrack. I typically run 40mm gravel tires, but have also mounted 35mm Compass Bon Jon Pass tires for road rides. For Dirty Kanza, in two weeks time, I'll be aboard the BMC. I'm running a 1x11 drivetrain with a 44-tooth Salsa singlespeed ring and a Shimano 11-40 cassette. Shifting is accomplished by a 105 5800 shifter, an XT M8000 rear derailleur and a Lindarets Tanpan converter (making the incompatible pull ratios of the road and mountain 11-speed components work). Brakes are Paul Minimoto. Brake cables and housings are Jagwire Road Elite Link in what I think is a very fetching blue. Teravail Cannonball tires are tubeless and measure 41.5 millimeters wide on HED Ardennes+ rims. A Moots titanium seatpost holds a much-loved Selle SMP Dynamic saddle. A 13cm Thomson stem connects a World Bicycle Relief limited edition Cane Creek stainless steel headset to a Salsa Cowbell (44cm) that is double wrapped. PRO Missile Alloy aerobars take pressure off of my hands over the long miles. A Garmin eTrex 30 will help with navigation and is mounted to a carbon computer mount I fashioned out of a cut-off 1 1/8" steerer tube. A Paul Gino light mount on the mid-fork mount holds a Cateye Volt 800 headlight. Cateye Rapid X rear blinky is on the non-driveside seatstay. Other accessories include two Salsa Nickless cages, an XLab Gorilla cage, Revelate Gas Tank, PRO Team CNC pump and a Jandd Mini Mountain Wedge that holds two tubes, some patches, a singlespeed cog, multitool, tire lever, chain lube, CO2/inflator and various other small bits I like to carry. How can you not love that color! This is a clever Rotor crank that uses road arms and Q factor but a 110/74mm double mountain bike spider. Right now I'm only using the 110mm outer mounting for the Salsa 44T ring. Lindarets' Tanpan allows you to use a Shimano 11-speed road shifter to actuate a Shimano 11-speed mountain bike derailleur. This gives me access to a wide ratio cassette and a clutch rear derailleur for good chain retention over bumpy gravel roads. It's worth nothing that this is actually far easier with SRAM and doesn't require an adapter. I used a section of Nokon shift housing for the short section from the frame to the Tanpan. Mega tire clearance even with a 41.5mm tire. Love this bike! Home is where you can sit comfortably for hours on end. Selle SMP saddles work really well for me, both its Drakon and the Dynamic pictured here. I like a clean cockpit and this fits the bill. I like the PRO Missile Alloy clip-ons a lot as they offer a huge range of adjustment. No need for snobbery, Shimano's 105 5800 levers work great. They also feature the same reach adjust offered on Dura-Ace and Ultegra. Salsa Nickless cages are inexpensive, hold bottles well and last ages. The PRO Team CNC pump is a good one. I'll also carry a couple Co2. A cage just clears the 44T ring. I'm using an XLab Gorilla cage for the underside of the down tube location. Both the Gorilla and Chimp cages from XLab hold onto a bottle incredibly well. Haven't lost one yet with them! I bought the Crux frameset while I was at VeloNews. I wanted a disc brake bike to test certain products and the Specialized was a great value. It has seen the rounds. I've done cross races on it, gravel races, lots of winter miles. Kristen raced it for a couple seasons. Recently I got it back after KP got a new cross bike. This build is one of my favorites to grace the frame. It's nice, functional and reliable. As pictured, the bike is accessorized for the Land Run 100 in early March. I have some travels before I go there and I like to have my bikes dialed before toeing a start line. So far so good! Gravel appropriate gearing (for me) thanks to a Sugino OX801D crank with 44/30 rings. 10 spd Shimano derailleurs and shifters with a fancy SRAM Red 11x32 cassette. It's not supposed to work but it does. It's a mess of a cockpit, but it's everything you need for an unsupported 100-mile gravel race. I'll wrap the aerobars with some tape before I go. Specialized Trigger 2Bliss tires are pretty great. Roll fast and corner well. They are the limit on width for the rear of the Crux while still allowing for some mud clearance. When I decided to go back to Banff, Alberta for another try at Tour Divide, one of my first calls was to Kevin Harvey of Harvey Cycle Works. He has built a lot of randonneur bikes that include dynamo hubs, custom lighting and clearance for two-inch tires (or space for 650b x 42mm tires and fenders). We worked together on a gravel bike inspired by his rando bikes for NAHBS one year and it served as a test bed for the bike detailed here, even down to the paint. I knew that I wanted a bike that provided a high level of compliance. Lightweight, small diameter tubing accomplished that. Harvey also included extra bottle mounts on the fork legs and underside of the down tube. Di2 and mechanical routing were both installed. The Rando Adventure is a super versatile bike. With slick tires, fenders and a road gearing it's a super comfortable bike for day-long rides. I can also outfit it for gravel events with Bruce Gordon Rock 'n Roads, or Surly Knards, or even Soma B-Line tires (what I used at Trans Iowa). If gnarlier terrain is ahead, 27.5 x 2" tires also fit. The HCW in Adventure trim, photographed near sunset in Ovando, Montana on the 4th of July 2015. It was a great bike for Tour Divide. I ran a Bruce Gordon Rock 'n Road rear tire and a Maxxis Crossmark front, Di2 shifting and mechanical disc brakes. The JPaks frame bag is custom, with internal pockets, dividers and space for a one liter bottle on the seat tube. Kevin Harvey, a longtime friend from my home state of Indiana, built me this bike in 2011 when I worked at VeloNews. I was a temporary member of Rapha's Continental team and we rode the US Pro Challenge route in Colorado that year. I built the bike late in the process and climbed aboard for only the second or third time to start the ride only a day after flying home from my first Dirty Kanza 200. To say I was shattered is an understatement. Pictured above is its first build and as I used it for the Continental. Since then, it has served as a test bed bike and a great travel companion. It's seen duty in Germany, Switzerland, Liechtenstein, Austria, Belgium, France (where I got to ride hot laps on the Roubaix Velodrome with James Huang) and all over the U.S. I did Tim Johnson's Ride on Washington on it and took it to several races when I was covering tech. It was also used as a baseline for aero bike testing at the A2 tunnel for a VeloNews article. It's a well-traveled bike that has never let me down. Drying out after a rainy day in Germany and Switzerland. Rode with Lennard Zinn and Morgan Nicol from Eurobike in Friedrichshafen, Germany to Lugano, Switzerland over the course of a few days.